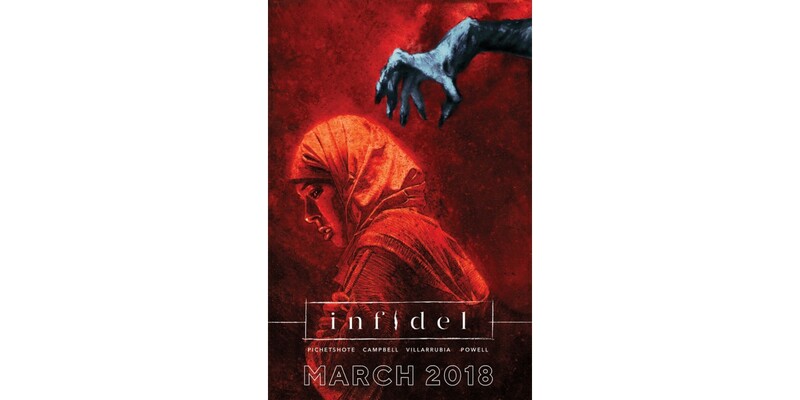 Bestselling writer and former Vertigo editor Pornsak Pichetshote and artist Aaron Campbell give horror a new name in the forthcoming INFIDEL set to launch from Image Comics this March 2018. Rife with political undertones, the new series will explore Islamophobia through a haunting and chilling story about one American Muslim woman and her multi-ethnic neighbors who move into a building haunted by creatures that feed on xenophobia. This tautly-woven new series tackles controversial topics in race and racism and how it can affect people from different cultures. INFIDEL features a diverse, multi-ethnic cast where character backgrounds affect the plot twists and pacing as the story unfolds from issue to issue.